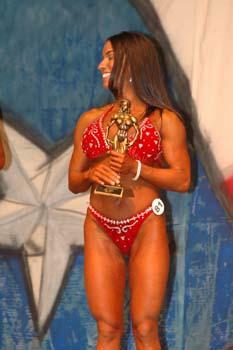 I decided to compete in my first figure competition with only 8 weeks to prepare. Even seasoned competitors allow for 12 weeks or so to prep, but even with such a short amount of time to train I knew I had an opportunity to make the very best of the time I did have — All I would have to do was put my training and diet in Erik Ledin’s hands. I had seen the amazing transformations of others who followed his plans, and I was more than willing to do so myself. I knew Erik was not a fan of endless hours of cardio, but still, I was amazed that my pre-contest plan did not have much cardio at all— and not even every day. I competed alongside friends who did two daily, long, steady state, boring cardio sessions coupled with long, high rep, boring weight training sessions (sometimes even back to back! )—and guess what? I did much better in my competition than they did. Erik’s plans truly are no-brainers. Everything is laid out for you. Everything. You don’t have to think about anything; just adhere to your plan and you will get unbelievably amazing results. I did.